Jesse is anything but bleak, but he wears black, so who would know? His new alternative school trends toward positivity, calls buildings and teachers by their first names and is low on control. It’s a place where Hunter’s menace has free reign. But why does Hunter do what he does when his heart seems to be in the right place. Occasionally. 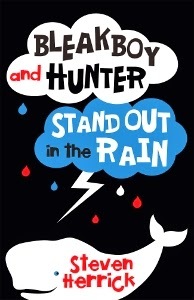 Bleakboy and Hunter Stand Out in the Rain is full of funny moments, mysteries that don’t want to be solved and growing friendships. Get ready for a gentle ride through family ups and downs, one classroom’s attempt to save the whales, and a minor financial disaster that leads to meals of rice and yams. The quote on the back of the book: ‘Some things are too big for a boy to solve alone’ becomes truer with every passing chapter. From Jesse’s big sister to the old man in the park, every voice in Steven Herrick’s latest yarn throbs with personality. Especially Bleakboy’s and Hunter’s. A light read that drills below the surface to deeper truths and feelings.